The Aussie band ZOOT split in 1971. But they might be back. According to Undercover.fm, Zoot will reform initially for the Rick Springfield and Friends Cruise in November. I’m a bit excited about this, because I love Zoot. 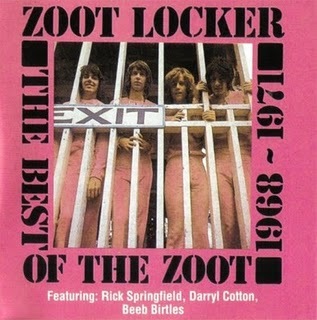 Their album, Best of the Zoot Locker is one that I have spent hundreds of hours listening to. It’s very rockin’ stuff. And it turns out they’re from where I live now. The members of Zoot formed as Down The Line in Adelaide in 1965. In 1967 they relocated to Melbourne and changed their name to Zoot. Their biggest hit was their hard rock cover of The Beatles ‘Eleanor Rigby’ in 1970 but in 1971 it was all over. And if you haven’t heard that cover of Eleanor Rigby, by god you must. Here it is.